Just about everyone loves tomatoes—if not raw, then in a sauce. But not everyone realizes how healthy these luscious red fruits can be. Whether it’s a handful of cherry tomatoes, tomato sauce or juice, here are five reasons to feel extra good about eating tomatoes. One cup of tomatoes gives you 2.2 grams of fiber—that’s 8 percent of the daily-recommended level. Vitamins! One tomato gives you a whopping 28 percent of your daily vitamin C requirement. 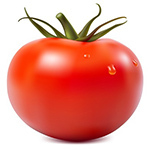 One cup of tomatoes gives you 15 percent of the daily-recommended B6 and 12 percent of recommended iron. Tomatoes are rich in lycopene, a phytonutrient that has numerous health benefits, like lowering prostate and breast cancer risk, and aids in healthy skin. Hint: Cooked tomatoes offer the highest lycopene levels. Tomatoes contain a lot of water, making them filling. A sliced tomato with some balsamic vinaigrette, along with a handful of nuts or a slice of cheese, makes a satisfying low-cal snack. Drinking a glass of tomato juice each day may lower levels of inflammatory compounds. Inflammation is associated with many chronic diseases, such as cancer, arthritis and diabetes; so drink up.